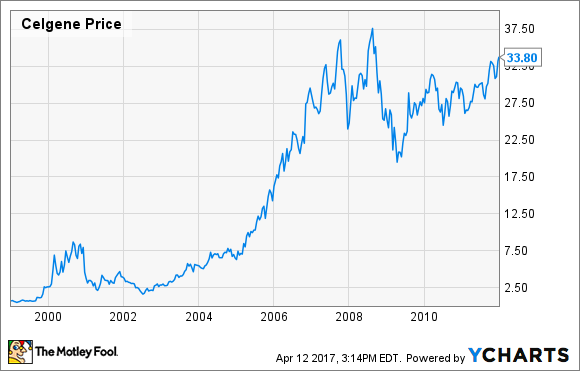 A brief look at Celgene stock history and the company's transformation from a small chiral chemical supplier to a giant biotech. A quick analysis of Celgene Corporation (NASDAQ:CELG) stock history reveals three distinct stages with four stock splits along the way. These stages led to the company becoming what the following chart shows it to be -- one of the biggest biotechs in the world. Celgene has come a long way from its start as a spinoff of chemical manufacturer Celanese. Here's a brief look at those three stages of the biotech's stock history. For much of its early history as a stand-alone company, Celgene primarily focused on selling high-purity chiral chemical intermediates. 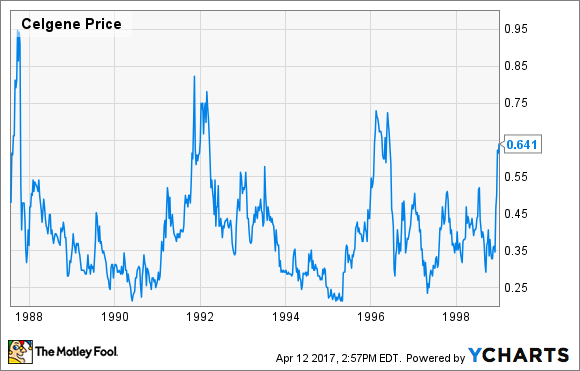 And Celgene's share price went through several booms and busts during the first decade or so. Based on this chart, you might think that Celgene was a penny stock for quite a while, with shares trading below $1. That's actually not the case, however. The data has been adjusted to reflect a three-for-one stock split in 2000, a two-for-one stock split in 2004, another two-for-one stock split in 2006, and a third two-for-one stock split in 2014. Celgene sold its chiral chemicals business to Cambrex Corporation in 1998. The company continued to use its expertise in chiral chemicals to develop drugs, though, including a chirally pure version of ADHD drug Ritalin. The next stage of Celgene stock history was one of fast growth. From 1999 through 2011, the biotech's share price soared more than 4,800%. Celgene enjoyed its first profitable year in 2003, thanks to Thalomid. The drug was originally approved as a treatment for a side effect of leprosy called erythema nodosum leprosum (ENL). However, physicians began prescribing Thalomid off-label for treating multiple myeloma and other blood cancers. In 2006, Celgene won U.S. regulatory approval for Thalomid in treating multiple myeloma. An even bigger development for the company, though, was FDA approval in late 2005 for Revlimid as a treatment for myelodysplastic syndromes (MDS). Revlimid first topped the $1 billion sales level in 2008 and went on to become Celgene's biggest success. During this period of rapid rise for the stock, Celgene also made several strategic acquisitions. In 2008, it completed a buyout of Pharmion. The deal brought Vidaza into Celgene's product lineup. Vidaza received FDA approval in 2004 for treating MDS. In 2010, Celgene acquired Abraxis Bioscience. The crown jewel for Abraxis was cancer drug Abraxane, which obtained FDA approval in 2005 as a second-line treatment of breast cancer. With soaring sales for Revlimid and solid growth for Abraxane and Vidaza, Celgene stock was already performing very well as 2012 rolled around. Over the next five years or so, the company's share price nearly quadrupled, catapulting Celgene into an elite group of the most successful biotechs in the world. Revlimid continued to be Celgene's biggest moneymaker. However, other drugs came along to add to Celgene's growing fortunes. Pomalyst won FDA approval as a third-line treatment for multiple myeloma in 2013. Within three years, the drug reached blockbuster sales status. An even bigger winner was Otezla. Celgene gained approval for the drug in 2014 for treating psoriatic arthritis and moderate to severe plaque psoriasis. Otezla generated over $1 billion in sales last year. Celgene made yet another tremendously important acquisition during this third stage of its stock history. In 2015, the company bought Receptos, picking up ozanimod. Celgene plans to submit the drug for approval in treating multiple sclerosis this year. The company also has a late-stage study underway evaluating ozanimod in treating ulcerative colitis. 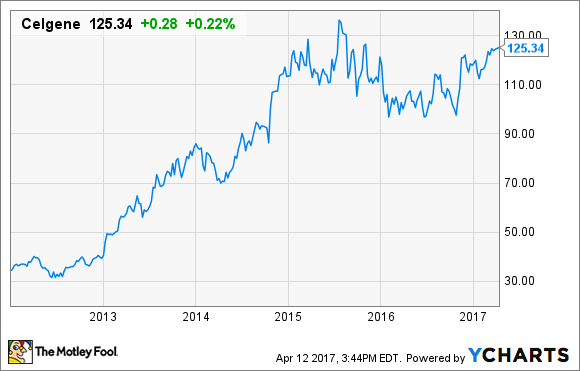 What will the future of Celgene stock look like? Probably a continuation of its past success. Celgene expects to announce results from 19 late-stage clinical studies over the next couple of years, with nine other programs advancing to pivotal trials. It's possible that the biotech will launch as many as 10 new blockbuster drugs over the next seven years. Celgene's deep pipeline could very well position the company for its fourth stock-history stage.